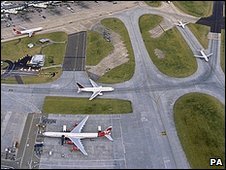 A third runway at Heathrow airport would provide a £21.7bn boost to the UK economy, the British Chambers of Commerce (BCC) has suggested. This is the single largest benefit from 13 key transport projects that would boost the economy by £85bn, it said. The business group said spending on key UK infrastructure projects must not be cut despite tight public finances. UK firms believed investment was "essential to the future success and growth of regional economies", it said. The Labour and Conservative parties have said they would cut public spending to reduce the budget deficit. "Transport infrastructure cuts must not become a politically convenient way to slash spending after an election, especially when there are huge savings to be made in far larger budgets, including health, education and welfare," said David Frost, the BCC's director general. "Cutting or scrapping plans for regional transport improvements means fewer jobs, and ultimately fewer businesses driving recovery." The BCC put the total cost of the infrastructure projects, which include London's Crossrail train link, a third runway at Heathrow airport, as well as road and rail improvements, at £29.8bn. The public sector would contribute £3.1bn a year for five years, with the private sector making up the remaining £14.3bn. Transport Secretary Lord Adonis said: "Even in tough economic times, we must continue to invest in vital transport infrastructure which benefits jobs, businesses, our economy and the environment."